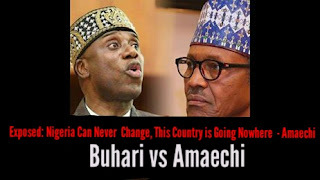 According to an audio report published by Reno Omokri Early today revealed the conversation of Rotimi Amaechi speaking Against Buhari's Administration, Maintained that Nigeria is Going nowhere except everybody is killed. According to Omokri, Presidency Spokesman Tolu Ogunlesi admitted and confirmed that it was actually Amaechi who made the shocking statement. BOMBSHELL: LISTEN and SHARE Part 2 #AmaechiTapes. Rotimi Amaechi, DG of Buhari’s campaign said “This country can never change, I swear. The only way this country can change is in a situation where everybody is killed. This country is going nowhere.” LISTEN and SHARE widely.